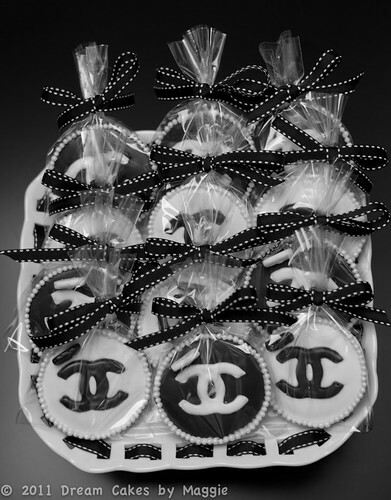 If you are a Chanel lover, these cookies will make you scream. 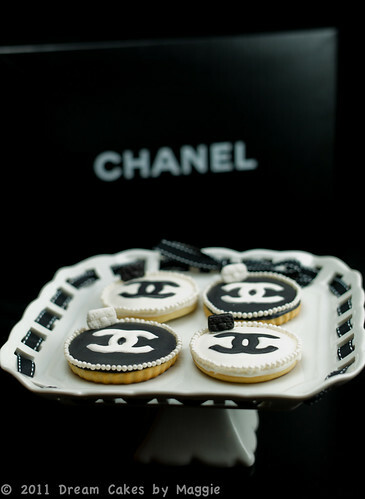 These Chanel cookies were made for a group of Chanel fanatic. For them, I decided to go with elegant logo design. 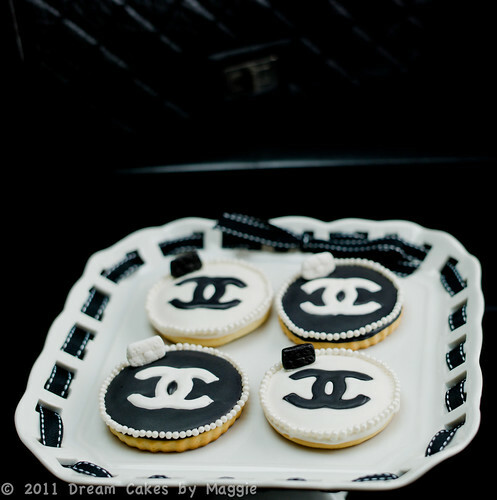 Two tone logo Chanel cookies, black & white, symbolized simple, classy and chic. 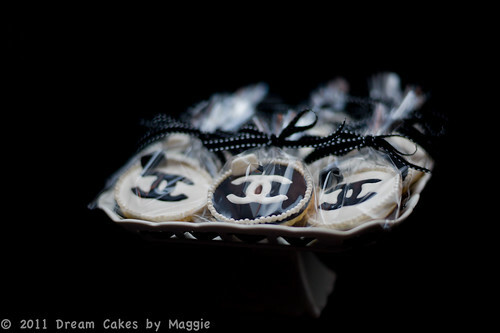 Fashion sometimes can simply be delicious especially when it is sweets made available for A list parties. 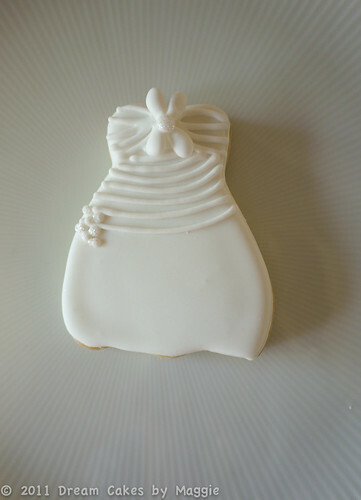 Every socialites should indulge themselves with one of these cookies. You can check out my Flickr for more pictures. 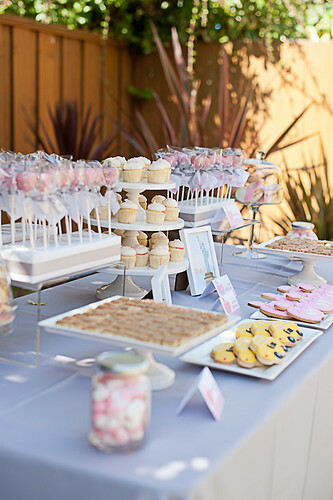 Weddings are always sweet and loving. 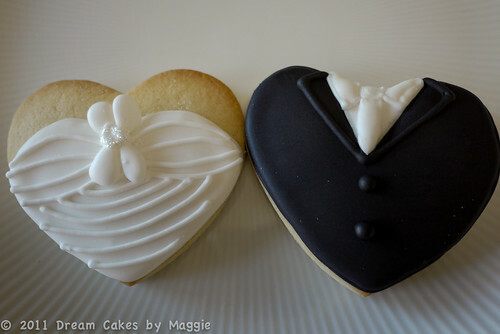 What’s more sweet than having matching bride and groom cookies? 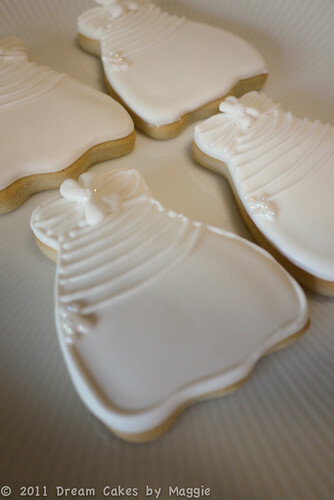 I made these cookies for a bride as a surprise. 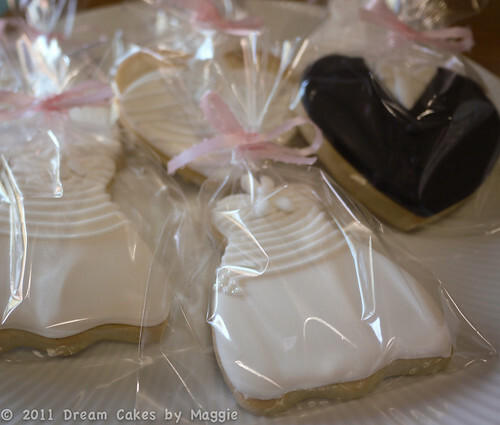 When she saw the cookies, she couldn’t believe her eyes and said “that’s so beautiful and the cookie matches my dress.” I just couldn’t believe these cookies can make someone so happy. 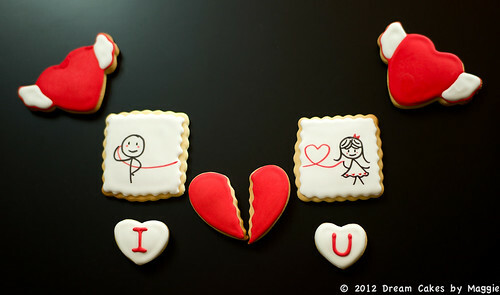 My best wishes to the newlywed & happily ever after!! 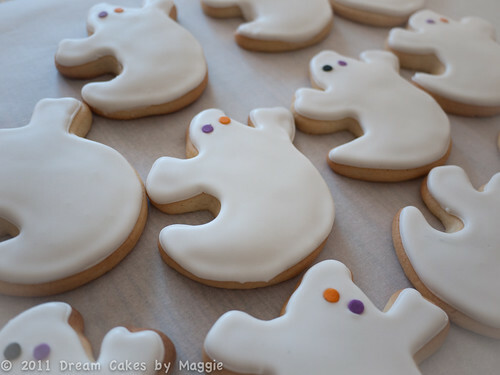 This Halloween was full of fun and baking. I’ve tried making something that I’ve never done before this year. 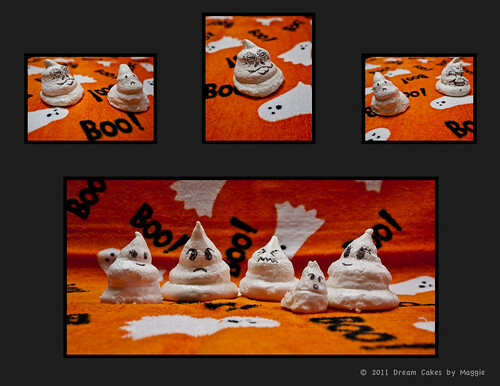 Since the ghost has been my Halloween favorite so I decided to make Halloween Meringue Ghost. This was my first time making meringue but it was a fun experience. There were so many key things to watch out for making a great meringue. 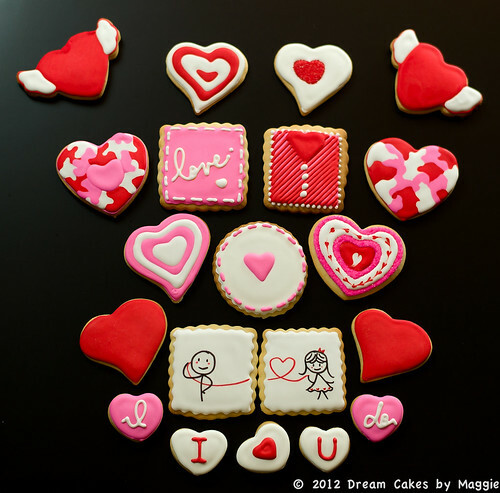 How the eggs whites were beat, the type of sugar used, the duration of baking and decoration. Even though it didn’t come perfectly but they definitely look festive. 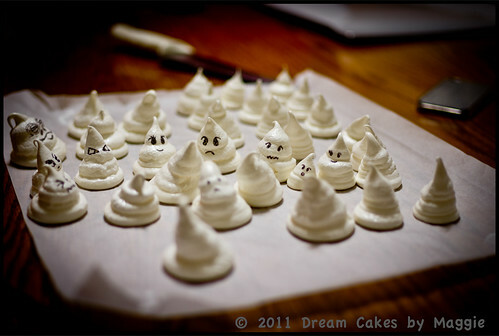 After the meringue ghosts were cooled, I used the edible pen to draw the facial features. 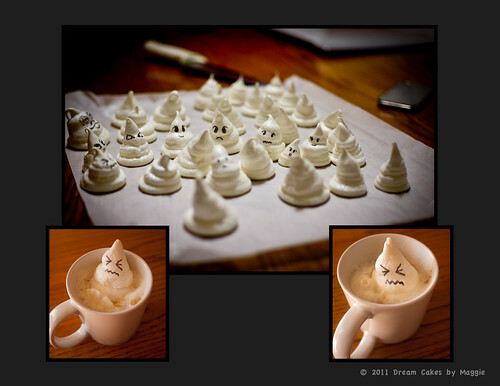 I found piping the ghosts and drawing were the most fun part of making the ghosts. 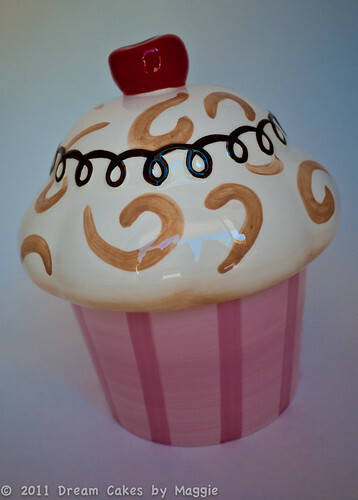 I walked into the store and saw the cupcake jar and just couldn’t believe my eyes with what I saw. 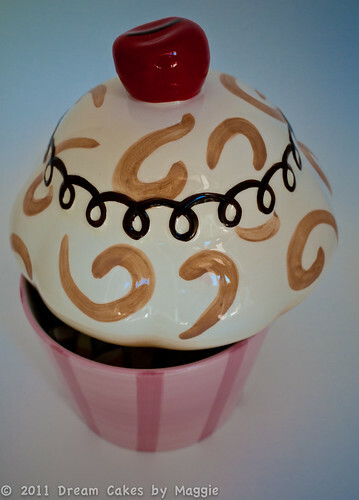 “Holy cow, it’s a Cupcake Cookie Jar & it’s soooo cute!! 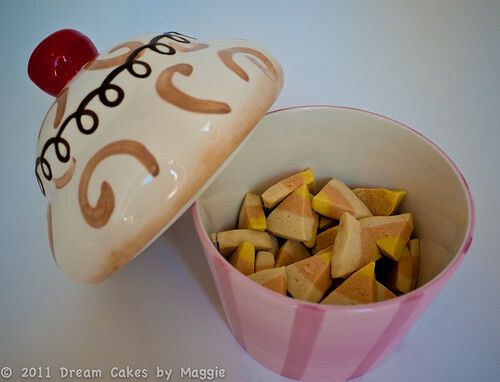 !” As soon as I picked up the cupcake jar, I paused for a few second, asking myself “Do I really need one?” Then I quickly put it right back and walked away from the baking aisle. You would wonder what happened. I think most of you are going to be right. Yes, I went back to the baking aisle and put the cupcake jar in my shopping cart. I quickly paid so I won’t change mind again. 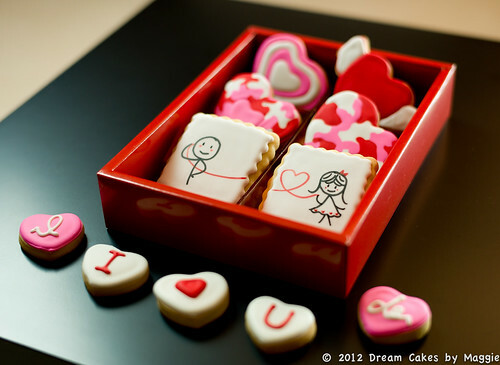 =) I was so excited and wanted to put something in the cookie jar. 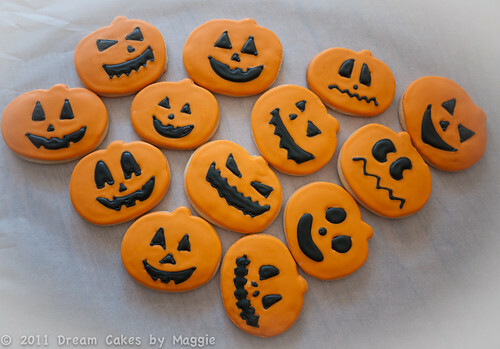 So I decided to make some Halloween cookies since it’s coming up soon. 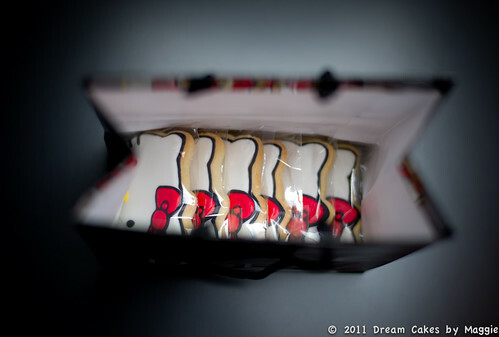 Want to take guess of what’s in the cookie jar? 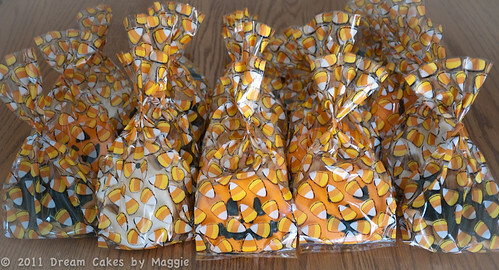 Thanks for checking out my blog and please stay tune for more Halloween updates this week. I would like to share with everyone that I am using Pinterest to collect beautiful, cute and cool things that inspire me. Please check it out and hope my collections will inspire your life. 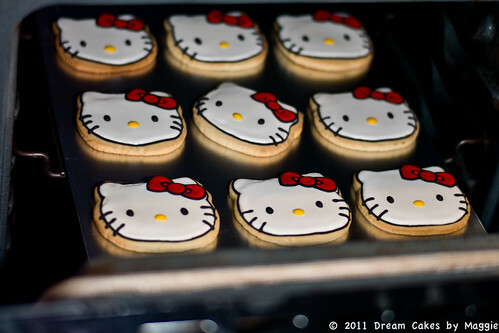 Every time I asked little girls “What kind of cookies do you like?” 99% of the responses were “HELLO KITTY”. Therefore, I decided to give myself a try for the first time. 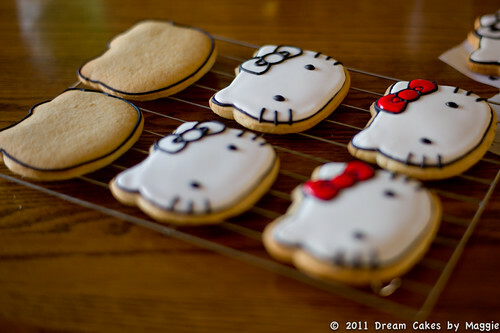 Since I didn’t have a Hello Kitty cookie cutter so I ended up hand cutting all the cookies. 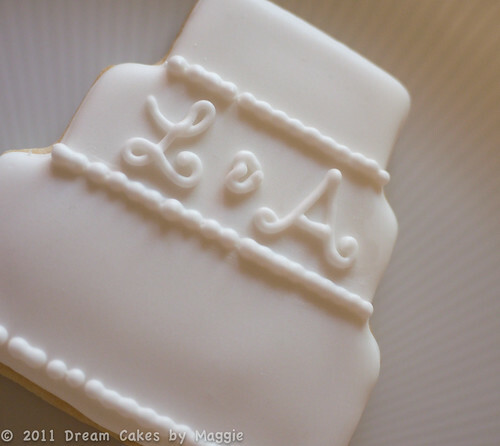 These cookies were about 4″ width x 3″ height. 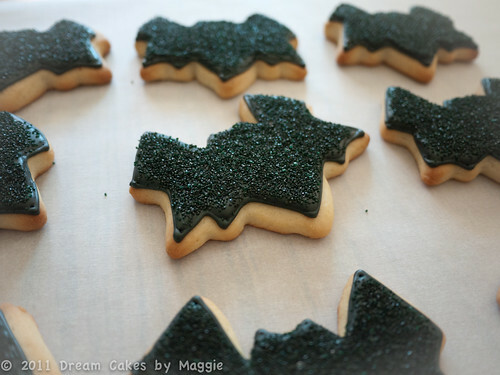 The cookies were then baked, outlined with black icing, and filled with white icing. 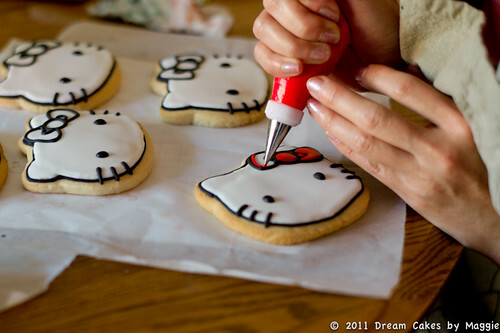 Once the first layer of icing dried completely, I decorated the red bow, eyes, nose and whiskers. 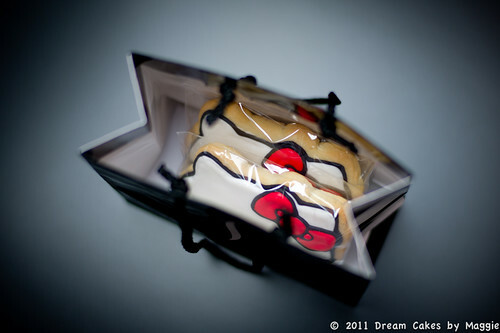 Hello Kitty Cookies were wrapped in the bag. 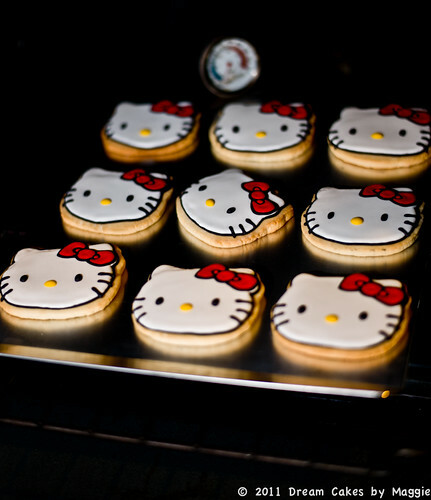 More Hello Kitty pictures on Flickr. 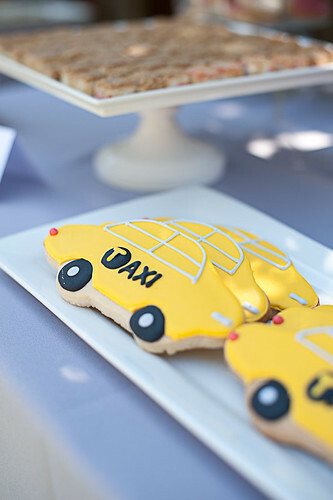 Dream Cakes created the “Made in NY” apple sugar cookies, taxi cookies and fondant cake topper for a very unique baby shower. 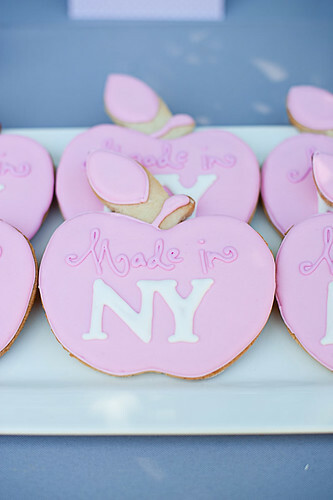 The apple cookies were customized to match the invitation. 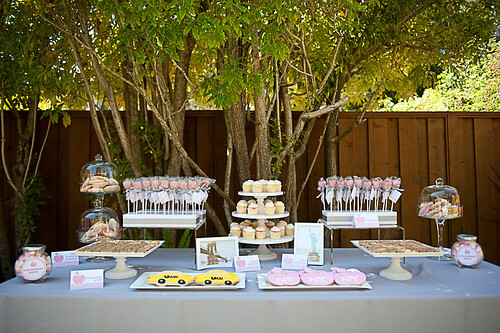 Please check out Coquette Events for more event details. Congratulations to Andrea & her family!! 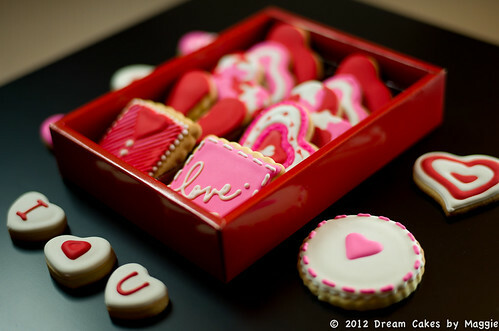 Photos were taken by Vero Suh Photography. 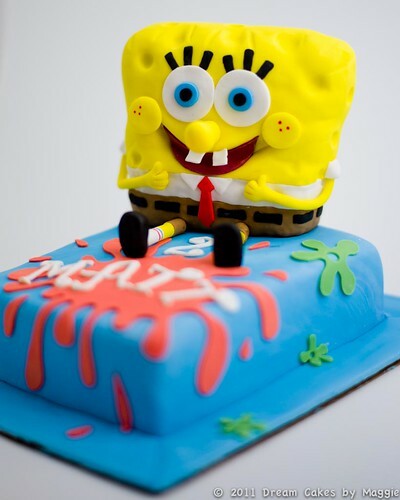 SpongeBob is the birthday boy’s favorite character so I made him a 3D spongeBob cake. 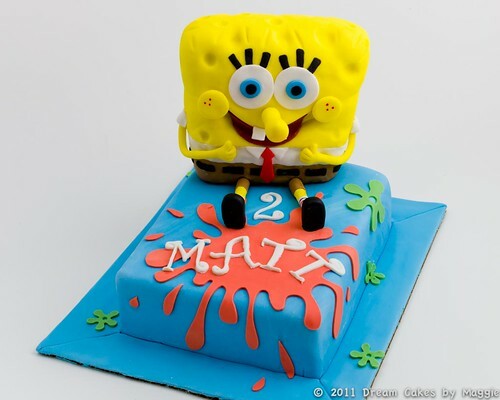 SpongeBob figurine is approx 6″ tall with two thumbs up for turning 2 years old. 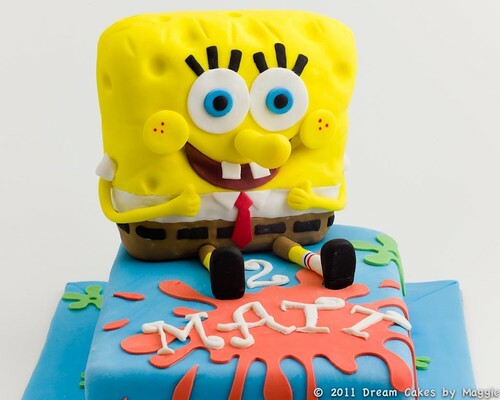 The cake was a two layer 7.5″ x 4″ filled with fresh banana and whipped white chocolate frosting. 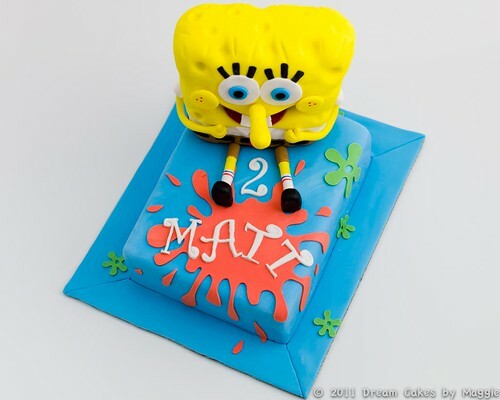 The cake was covered with marbleized blue fondant to symbolize the sea and with orange splat and green floaty to accentuate SpongeBob’s colors. 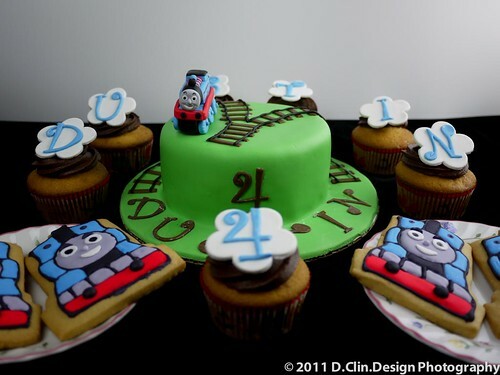 Thomas theme cake, cupcakes and cookies are preschoolers’ favorite. 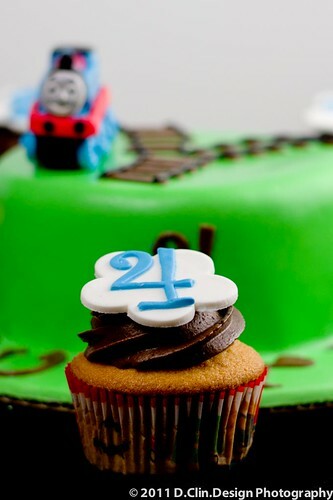 This cake was customized for a 4 year old birthday party at school. It was a surprise for all the kids and they couldn’t take their eyes off the cake. 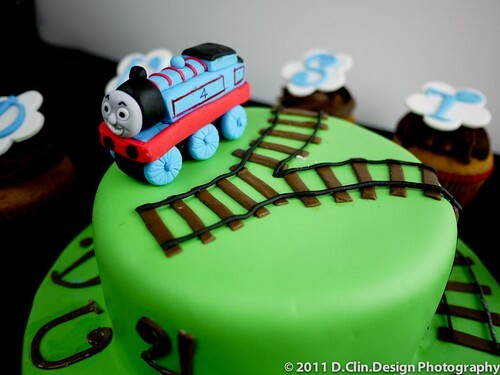 Every kid was trying to figure out where the train track is going and admiring the details on Thomas. 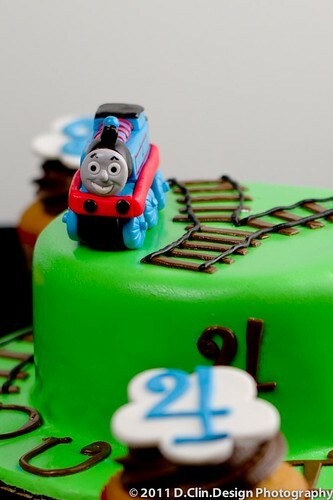 Some child even noticed the number on Thomas was different. 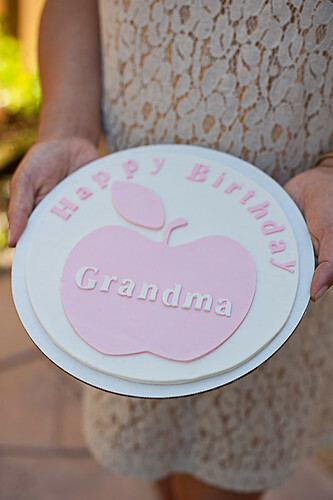 The cake was a two layer 6″ pound cake filled with whipped chocolate frosting and covered with fondant. 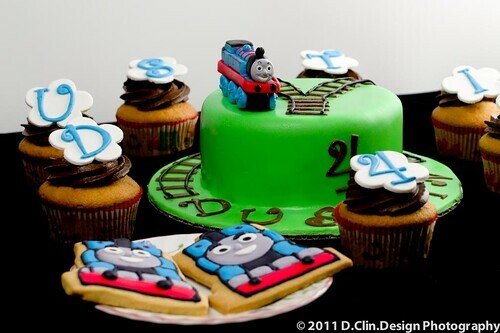 The Thomas figurine was made out of fondant and it was 100% edible. 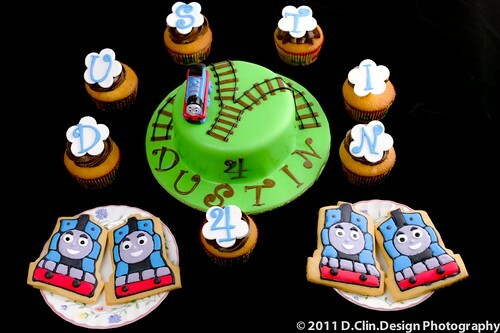 The cupcake with fondant topper symbolized the smoke from the engine and I created name and age to made the setting more personal. 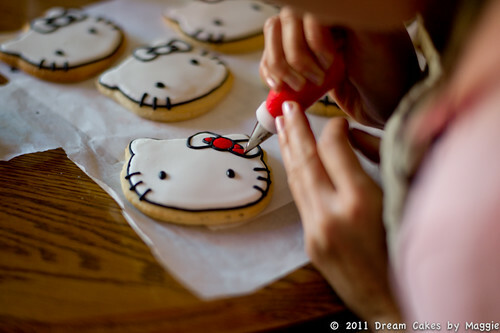 The decorated Thomas sugar cookies were about 4-5 inches and they were given to each child as a party favor. Overall, it was such an amazing experience to see different reactions form the children and how much they enjoy the cake.